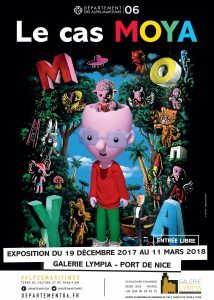 « Le cas MOYA » by Artist Patrick Moya is an awesome colourful, jolly, fun and family friendly art exhibition going on right now until the 19th of March 2018 at La Galerie Lympia in Nice. And best of all – Its FREE!!! This « intro-rétrospective » exhibition take a look back Moya’s work and brings together his key pieces in this interesting collection. So who is Patrick Moya? Well there are not many on the Cote D’Azur who haven’t already heard of Patrick Moya. He is very active in the local art scene, regularly attends his own exhibitions and is extremely accessible and approachable. You may have even bumped into him going about his business in the region. Moya is a prolific abstract artist, his work includes paintings, art films, billboard art, conceptual art, drawings, fashion art, muralism, ceramics, sculpture, video art and much much more. Moya has a collection which encompasses over 4500 pieces between 1971 and 2018. His work has been featured on buses in the city of Cannes and on designer clothes. He has also designed dolls for UNICEF and his frescoes can be found in the Princess Grace Hospital in Monaco amongst other places. He has focused heavily on computer art and has created a virtual world called “Moya Land” His 3 main characters are his alter-ego said to be based on the character Pinocchio which is where the long nose comes from. A sheep called Dolly based on the cloned “Dolly the Sheep” and his avatar “Moya Janus” who you can meet in Moyas vaste and exciting virtual universes. Did you know that in Moya land you can go shopping. There is a bookshop a florist and a bakery!, You can attend a concert, learn the history of “Moya Island” and take guided tours. Moya Land even has its own tourist office for visitors to the virtual-verse. It is a globally accessible work of art you can “virtually” jump into: you will find the artist himself living and working inside. Today, Moya is living between real and virtual Worlds. He participates in and organize many exhibitions both real and virtual. One of the cutest ideas for kids is his virtual car in which he gives his visitors a personally guided tour of his virtual exhibition. Note: there will be no guided visit available on the 2nd March 2018.